The old vines of Pinot Gris in the Clos Windsbuhl were planted by the previous owner in the 50’s and 60’s. In these days, the choice of root stock and massal selections were orientated towards quality and vines were planted in higher density. The Windsbuhl is located in a cooler part of Alsace and quite high in altitude (300 to 380m), which explains the late ripening character of this site, despite the solar facing and good slope. 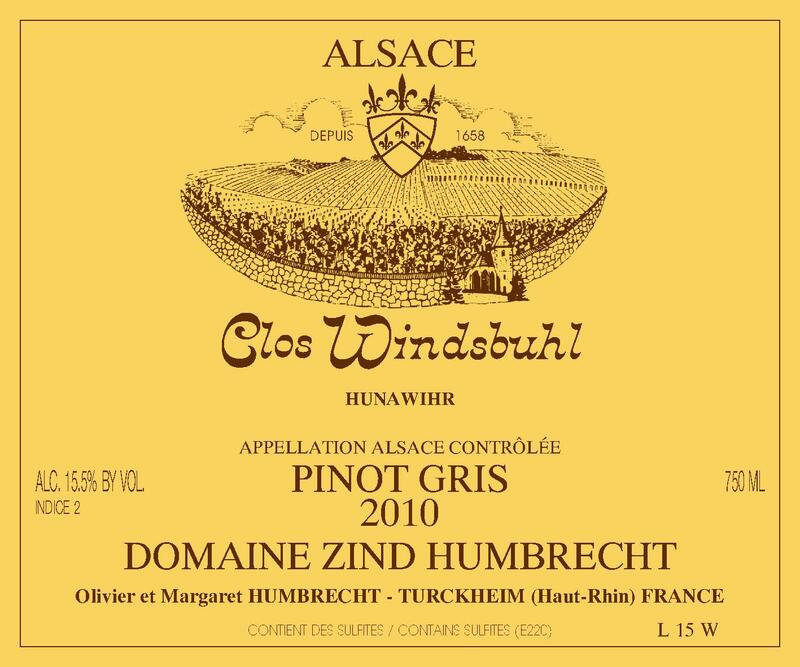 Like any late ripening vineyard, the Windsbuhl has the capacity to keep good acidity and also will allow the development of noble rot, mostly on the Pinot Gris grape. In 2010, it was quite phenomenal and we were able to separate the noble on these vines. We finally produced this drier wine but also a richer Selection de Grains Noble. Despite the relative richness of this wine, the fermentation was powerful and we were glad when it stopped. 3/2012: the nose shows all the delicacy of this vineyard. There is a harmonious sensation between ripe fruity nose (noble rot influence) and strong minerals. The palate is intense, feels quite dry with a balanced finish. This wine also has the ability to hide its power (which is quite a common quality for a lot of 2010s). It only needs a few more years of ageing now!